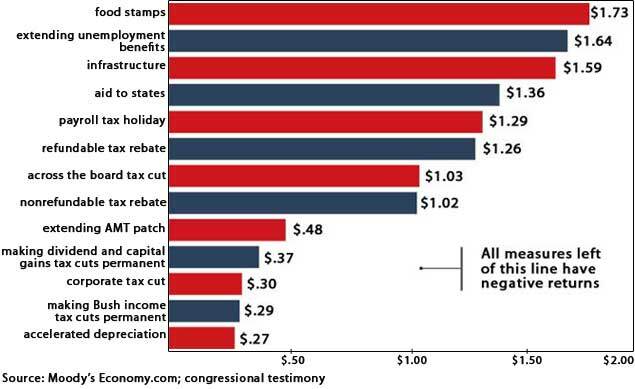 Which Stimulus Programs Have the Most Bang for the Buck? (Click here for full image). Of course, there will be a fierce debate about whether there is the money for any stimulus program, when the government has already run up huge obligations for which it cannot pay. And of course, if there is a stimulus plan, people will argue as to who should receive the stimulus based on ideology (For example, Galbraith is liberal, so he argues for liberal causes). I'm not going to weigh in on any of these questions. I'm just sharing the info presented in the chart.